Comedian Tracy Morgan, who co-starred in Saturday Night Live (SNL), 30 Rock and Scare Tactics, filed a lawsuit on Thursday against Wal-Mart Stores in relation to the accident caused by a Wal-Mart truck driver which resulted in a broken leg, fractured ribs and other injuries. The lawsuit alleges that Walmart should be held partially liable for the crash, which occurred on the New Jersey Turnpike on June 7, 2014. The Wal-Mart truck, driven by company employee Kevin Roper, 35, of Jonesboro, Georgia, reportedly swerved into the back of the Mercedes Sprinter limo bus to avoid slamming into slower traffic that was ahead of it, according to Sgt. Gregory Williams of New Jersey State Police. Police allege that Roper had not gotten any sleep for over 24 hours and that he might have momentarily fallen asleep at the wheel. Roper, who was not injured in the accident, pleaded not guilty at a preliminary hearing and has posted the $50,000 bail that was set. He has been charged with three counts of injury by auto and one count of vehicular homicide. The Wal-Mart truck driver is currently out of jail pending whatever date the judge set for his trial. The truck wreck involved six vehicles in all and it also resulted in the death of a close comedian friend of Morgan’s, James “Jimmy Mack” McNair. 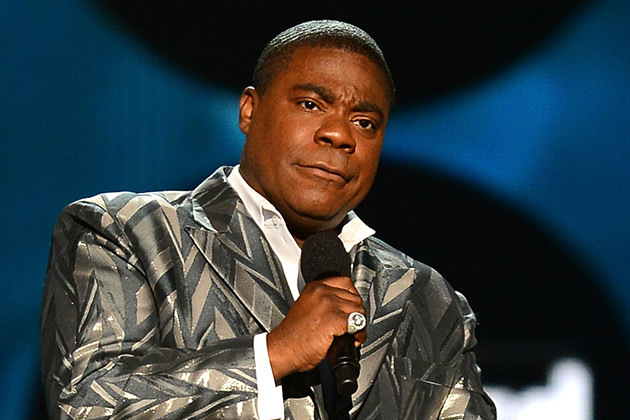 McNair who was riding in the limo bus with Tracy Morgan, 45, and others as it was headed back to New York City from a comedy gig in Dover, Delaware, that was part of his national “Turn It Funny” comedy tour. Besides Tracy Morgan, the other three plaintiffs in the lawsuit that they have brought against Walmart Stores are two other people who were injured in the crash, Jeffrey Millea and Ardley Fuqua, Jr. and Millea’s wife, Krista, who was eight months pregnant at the time of the accident. Like Morgan, both Millea and Fuqua were airlifted to a local hospital with numerous injuries. Millea is an assistant of Tracy Morgan’s and Ardley “Ardie” Fuqua is a friend and fellow comedian who opened the tour for Morgan. According to the lawsuit, Wal-Mart was both negligent in their not knowing that Kevin Roper’s lengthy commute from Georgia already added to the time he had been on the road and Wal-Mart should have also known that the was a problem with the brakes of the Peterbilt truck Roper had been driving. According to the lawsuit, Tracy Morgan, Jeffrey Millea, and Ardley Fuqua should be compensated for any lost wages and any potential future lost wages for the time that they have been unable to work due to their injuries. Also, the lawsuit states that Ms. Millea should be compensated monetarily because she “suffered from loss of society and consortium as a result of the injuries to her husband.” Besides Wal-Mart Stores, the lawsuit also names one of its subsidiaries, Wal-Mart Transportation. An investigation by the National Transportation Safety Board found that the truck was travelling at speeds of 20 mph over the posted speed limit. The lawsuit alleges that if Wal-Mart Stores and Wal-Mart transportation had not been negligent, the injuries the plaintiffs incurred in the accident could have either been not as serious as they were or they could have been avoided entirely. The lawsuit that Tracy Morgan and the three other plaintiffs filed against Wal-Mart alleges that the company was “careless and negligent in the ownership and operation of its motor vehicle.” The driver of the Wal-Mart truck, Kevin Roper, was allegedly travelling at 65 mph in a construction zone, when the crash occurred. The lawsuit alleges that reckless or intentional conduct on the part of Wal-Mart contributed to the seriousness of the June 7, 2014 accident and to the extent of the injuries that Tracy Morgan, Jeffrey Millea and Ardley Fuqua suffered.